Or, go eat some oysters. So, on a lazy afternoon, John and I spent some quality time at the back of the restaurant by the kitchen with Chef Björn Wester. (When you visit, consider sitting by the front window to enjoy great people watching in the square. Or you could always request a seat by the huge aquarium which lines the wall). Chef Wester shared a bit about the restaurant’s history, talked to us about oysters, and demonstrated his shucking skills. We then sat down for an oyster sampling, after which he insisted in having the staff present us with almost every creatively prepared item on the menu. What was intended as a brief oyster break turned into a wonderful afternoon of edible treasures, accompanied by great wine and sherry. Letting the chef take charge of the wine pairings from the impressive wine list, we enjoyed two wines from German Winemaker Martin Tesch (the 2011 Laubenheimer Karthauser Riesling and the 2012 Unplugged Riesling), one from France (a 2012 AIX vin de Provence) and an Andalucian sherry from Spain (Delgado Zuleta Monteagudo Pedro Ximenez Sherry). All perfectly matched our various courses, each of which was incredibly fresh and beautifully plated. While I could go on and on about the fabulous seafood dishes (and desserts), this is GoShuckAnOyster.com, so our focus is on the oysters. While Chef Wester was particularly proud of the oysters from the islands which make up the Zeeland in the southwest part of The Netherlands, they are in season in the winter. So, the restaurant’s daily oyster menu included a selection of oysters from abroad. While I prefer tasting oysters nearly naked (the oysters, not me! 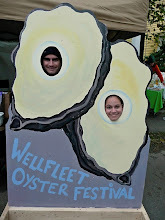 ), perhaps with only a light squeeze of lemon, we sampled them both raw and as prepared oyster specialties. Oysters deep-fried in tempura batter with black bean sauce kept flying out of the kitchen to nearby tables. Although we sampled oysters deliciously sauteed with hazelnut butter, we passed on the offer of Oysters Rockefeller, prepared with basil butter and spinach. Focusing on the raw oysters, I was thrilled to see Raspberry Points – one of my favorite oysters which I have enjoyed not only on their native Prince Edward Island buy also in many places around the globe -- on the daily menu. ($8.50 US dollars each). Greatly sized with a fantastic salinity, they were almost as tasty as the ones tasted on our summer road trip through Nova Scotia and PEI in 2010. The firm, crisp, mildly salty Fines de Claires from the Vendean coast of western France glistened in their shells. And at “only” $4.50 each (US dollars), they were surprisingly affordable (relatively speaking). Far more sweet - and significantly plumper – than the Vendée-Atlantique oysters were the deep-cupped wild oysters from Normandy ($5.00 each). Slightly smaller, and markedly firmer than the oysters from Normandy were the significantly saltier wild oysters from Brittany ($5.75 each). The most expensive oysters offered that afternoon were those from Marennes-Oléron (and incredible $10.75 each). The one I tasted was quite large, pleasantly chewy, slightly salty and had a semi-nutty finish. As the result of this pleasant afternoon chatting about – and sampling – oysters, a road trip along western France’s Oyster Coast seems inevitable in the not so distant future. On your next visit to Amsterdam, be sure to set aside some time to visit de Oesterbar. Who knows where it will take you. Open daily from Noon to 11:00 p.m.
Would you like us to try your oysters, review your product or write about what you're doing with oysters? Contact us. Email us your festival dates and we will add them to our list. Amazon.com - Buy a glove, knife or book. Copyright 2007 - 2019 GoShuckAnOyster. Picture Window theme. Theme images by MichaelJay. Powered by Blogger.